Consequently, if the relative contribution of NEC and NEP and the subsequent changes in TA and DIC were to change owing to future natural or anthropogenic perturbations, the resulting seawater Ω (and pH) will be different from that predicted by oceanic uptake of anthropogenic CO2 alone. 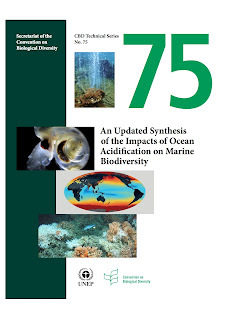 ...both NEC and NEP may be affected by the fundamental changes in seawater CO2 chemistry arising from ocean acidification, but the exact responses remain to be characterized. ...it is reasonable to assume that net CaCO3 dissolution during winter in Bermuda will gradually increase as the oceans continue to acidify, with dissolution events persisting over longer time periods and at a greater magnitude owing to lower Ω. It is important to recognize that even partial restoration of seawater pH and Ω as a result of changes to the NEC and NEP balance implies major alterations to the community composition, net reef accretion, and the function and role of coral reef ecosystems relative to today.